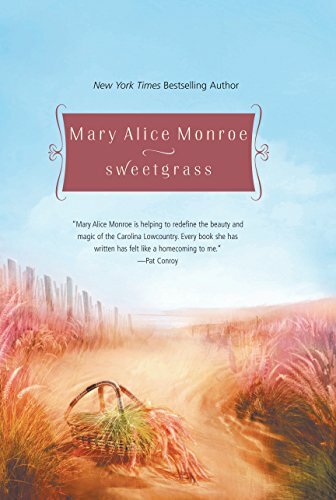 Sweetgrass by Mary Alice Monroe released on Jun 28, 2005 is available now for purchase. Mary Alice Monroe is a New York Times and USA TODAY bestselling author of thirteen novels. Her books have received numerous awards, including the RT Lifetime Achievement Award, Florida Distinguished Author Award, SC Book Festival Award, and the International Fiction Award for Green Fiction. An active conservationist, she lives in the lowcountry of South Carolina where she is at work on her next novel. Visit her at maryalicemonroe.com and on Facebook. "Until fairly recently, the coastal region of islands, marshes, placid rivers and oak-shaded roads had seen relatively little change—but now change is widespread, often overwhelming and sometimes devastating." March is a moody time of year in the Lowcountry. On any given day, seemingly by whim, the weather is balmy and sweet-smelling and can lure reluctant smiles from the hopeful who dream of cool, tart drinks on steamy afternoons, creamy white magnolia blossoms and scented offshore breezes. Then overnight, everything can change. With a sudden gust of cold wind, winter will reach out with its icy grip to draw a foggy curtain over the gray marsh. Mama June Blakely had hoped for an early spring, but she was well seasoned and had learned to keep an eye on the sky for dark clouds. A leaden mist hovered close to the water, so thick that Mama June could barely make out Blakely's Bluff, which stretched out into the gray-green Atlantic Ocean like a defiant fist. A bittersweet smile eased across her lips. She'd always thought it a fitting symbol of her family's turbulent history with the sea. Perched high on the bluff was a weather-beaten house that had been in the Blakely family for generations. Bluff House had withstood countless hurricanes and storms to remain the bastion of family gatherings long after most of the old Charleston family's land holdings were sold off. Each time Mama June looked at the battered house, waves of memories crashed against her stony composure. And when the wind gusted across the marshes, as it did now, she thought the mist swirled like ghosts dancing on the tips of cordgrass. Thunder rumbled, low and threatening. She tugged her sweater closer to her neck and shifted her gaze to the lowering skies. Weather moved quickly over the South Carolina coastline, and a front like that could bring a quick cloudburst and sudden winds. Worry tugged at her mouth as she turned on her heel and made her way across the polished floors of her home, through the large, airy kitchen, the stocked butler's pantry, the formal dining room with glistening crystal and mirrors, the front parlor appointed with ancestral furniture and straight out to the front veranda. Gripping the porch railing, she leaned far forward, squinting as she searched the length of ancient roadbed bordered by centuries-old oaks. Her frown lifted when she spotted a broad, snowy-headed figure walking up the drive, a lanky black dog at his heels. Mama June leaned against the porch pillar, sighing in relief. At that pace, she figured Preston would beat the storm. How many years had she watched and waited for her husband to come in from the fields? Goodness, could it really be nearing fifty years? Preston Blakely wasn't a large man physically, but his manner and personality made him imposing to anyone who knew him. People called him formidable in polite company, bullheaded in familiar—and she couldn't argue. He was walking with a single-minded purpose, heels digging in the soft roadbed and arms swinging. His square chin jutted out, cutting the wind like the mast of a ship. Lord, what bee was in that man's britches this time? she thought with a sorry shake of her head. On reaching the house, Preston sent the dog to the back with a jerk of his index finger. "Go on, now. Settle, Blackjack," he ordered. Then, raising his head, he caught Mama June's gaze. "Hellfire," he grumbled louder than the thunder, raising his arm and shaking a fistful of crumpled papers in the air. "They've gone and done it this time." Mama June's hands tightened on the railing as her husband came up the porch stairs. "Done what?" "They done got me by the short hairs," he said on reaching the porch. "The banks!" he roared. "The taxes. The whole cussed economy, that's who!" "Sit down a spell, Press, before you pop a valve. Look at you. You're sweating under that slicker. It's too hot for such a fuss and, I swanny—" she waved her small hand in the air "—I don't know what you're talking about. Taxes and banks and short hairs..."
"I'm talking about this place!" "There's no need to shout. I'm old, not deaf." "Then listen to what I'm tellin' you, woman. We're going to lose it." "Yes, ma'am, the land," he said. "And this house you're so fond of. We'll lose it all." "Press," she replied, striving for calm. "I don't understand any of this. How can we lose everything?" Preston leaned against the railing and looked out over his land. A cool wind rippled the wild grasses like waves upon the ocean. "Remember when we were reassessed a few months past?" When she nodded, he continued. "Well, here's what they say this property is worth now. And here's how much they say we've got to pay. Go on," he said, waving the papers before her. "Read it and weep." Mama June reached out to retrieve the crumpled papers and gingerly unfolded them. Her mouth slipped open in a soft gasp. "But...this can't be right. It's three times as much as before." "We can't afford that. We'll appeal. They can't force us to accept this." "They can and they will." "There are lots of folks round here that won't stand for it," Mama June said, hearing aloud the indignation she felt stirring in her breast. "This can't just be happening to us." "That's true enough. It's happening all over. And there's nothing any of us can do. Folks keep coming from the north in a steady stream." He shrugged. "And they all want to live along the water for the beautiful views. Trouble is, there's only so much property to go around. So property values just keep climbing and developers, like my own sweet, avaricious sister, are licking their chomps just biding their time. They'll wrestle away any and every acre of earth so they can turn around and plow it over with cement." He raked his thick, short white hair with his fingers. "Hell, I knew it was coming—we all did. I reckon I just didn't think it would be so quick." He gave a rueful smile. "Kinda like a hurricane, eh? Well," he said with resignation, "looks like we miscalculated on this one. Just like we did with Hugo." "We've always managed to hang on before. Through the war, the gas crisis, the bad economy, even Hurricane Hugo." "I know it. I've done my best—God knows I've fought the good fight. But I'm old now. And I'm worn out. I don't have it in me to fight them anymore." Mama June stepped forward to rest her hand on his drooping shoulder, alarmed to her core to see her usual bear of a husband so defeated. She was about to offer some platitude, to say "don't worry, we'll be fine," when she felt his shoulders cord up again beneath her palms. He exploded in renewed fury. "Maybe if that no-good son of ours had stayed home we wouldn't be in this mess." Mama June dropped her hand and wrapped her arms around herself. "Let's don't start in on Morgan..."
"Don't you go defending him," he said, whirling around to face her. "Not to me! He's my son, dammit. He should be here, helping his father run this plantation. It's too much for one man. I need his ideas, his energy. Is it too much to ask my only son to take his father's place?" "He needs to take his own place in the world," she countered softly, even as she felt herself harden against her husband. This was an all-too-familiar argument. "The hell with the world! It's Sweetgrass that needs him. It's his duty. His heritage! A Blakely has run Sweetgrass Plantation for eight generations, and though there may only be a few hundred acres left, by God, Sweetgrass is still in Blakely hands." "He's got his own land," she reminded him. "His own land?" Preston's eyes widened with incredulity. "You mean those few measly acres in the wilds of Montana that he hides out in when he's not out breaking some laws?" "Oh, for pity's sake. He's not doing any such thing. He's protesting!" "And for what? To protect some bison? Hell," he said with a snort. "Bison...He grew up calling them buffalo like the rest of us." "He's trying to protect them." "He's playing around. He's not working that land. He's not working, period." "Stop, Press." His angry words were shredding her composure like razors. "Worthless," he muttered, ignoring her. She turned and began walking away. "I can't listen to this...."
"What did I bother working for all these years?" he called after her. "That's what I want to know. I have no one to pass this all down to." She stopped and faced him with a cold stare. "You have your daughter." Preston scoffed and brushed away the suggestion with a sweep of his hand. "You can't keep brushing Nan aside." "Didn't she do just that to us when she sold off her land?" "That weasel! He only married her for her land." "What a thing to say!" She'd thought as much herself but had never granted it voice. "Lest you forget, I sold my land when I married you." "That wasn't the same thing at all, and you know it." "See, there you go. You always take their sides over mine." "I'm your husband! I should be your first concern. For once! I've worked all these years like a bull in the harness to keep this land intact, to keep hold of this house with all those antiques you love so much." "All of this." His arm swept out in a grand gesture. "I've sweated from dawn to dusk. I've spilled blood. I've given my heart and soul to this place. My dreams. My youth. And now..." He stopped, clamping his lips tight and looking out at the land with desperation shining moistly in his eyes. "And now it's gone." "Good!" she replied with heart. Preston spun around to look at her. "What'd you say?" "You heard me. I said good. Good riddance!" she cried out with a strained voice. She saw the pale blue of his eyes swimming with pain and shock at her outburst. But rather than take it back or soften the words, as she ordinarily might have done, she felt years of anguish burst forth with a volcanic gush. "All you think about is the loss of this land!" she cried, thrusting the papers into the paunch of his belly. "What about your family? What about that loss? You haven't spoken with your son in years. Your daughter feels like a pariah. They don't come around anymore. You've driven our children away. But you don't care about that, do you? You didn't fight to keep the family, did you? All you care about is this piece of earth. Well, it won't be long before we'll die and be buried on this precious land. But who will mourn our passing? I ask you, Preston, will our children weep when we're gone?" His face went still before he swung his head away, averting his gaze. She took a breath to gather her strength and stepped closer to her husband, narrowing the distance. Pounding her breast with her fist, emphasizing each word, she said in a voice betrayed by a shaky timbre, "This land has stolen my children from me. And that is a far greater loss to me. Good riddance, I say. I despise this land!" "You don't mean that." Preston's voice was low and husky. She took a long, sweeping glance at the landscape she'd called home for close to five decades. The roiling line of clouds rolled overhead like the closing of a curtain. Then she met his gaze and held it. "I surely do. From the day I first stepped foot on it, all this land ever brought me was utter and complete heartbreak." They stood face-to-face, silently recollecting the wide swath of years cut low by that statement. Around them the storm broke. Fat drops of rain splattered loudly on the dry ground in gaining crescendo. With each gust of wind the grasses swayed and shook, rattling like castanets. Then the sky opened up and the heavens cried. The roof provided no shelter from the torrents of rain, and both felt the lash of water that whipped through the air. Mama June doubted the rain hid from Preston the tears coursing a trail down her cheeks. Yet he did not move to console her or offer any word of either argument or comfort. Her shoulders slumped and she retreated inside the house. Preston stood rock still and watched her go. He was unmov-ing as he listened to his wife's tread on the stairs, knowing she made her way to her bedroom. She would likely cloister herself for hours, perhaps for the rest of the evening, shutting him out. He wouldn't go after her, wouldn't try to talk things through lest the words dredged up the past. She couldn't handle that, and he didn't know if he could anymore, either. Besides, it wasn't worth the risk of her retreating to a place far more inaccessible than her bedroom. He sighed heavily, her name slipping through his lips. "Mary June..."
He'd spoken harshly and was sorry for it. She was delicate when it came to matters of the family. He'd always tried to shelter her from bad news. But this...He squeezed the papers once more in his fist. This had hit too hard. He couldn't bear this alone. Hellfire, he'd needed someone to share this burden with, and who better than his wife? She was his wife, wasn't she? He cast a final glance up toward her room, where she was crying, and knew a sudden pain, as if the lightning in the sky just shot through his heart. "To hell with it!" he cried, drawing back his hand and throwing the cursed papers into the storm. The wind caught the papers, hurtling them toward the marsh faster than a Cooper's hawk. They landed, tangled in the tall grasses, beaten by the rain. Lightning flashed in the blackening sky, and by the time he heard the rumble of thunder, he was in the house, reaching for the snifter of brandy. The storm passed quickly on its march from the mainland to the sea. Now the air was fresh and the pastel pinks of the sunset had deepened to a rich ocher. Preston sat on the porch, his clothes damp and his skin cold, staring out at the purpling sky while the brandy did its work. Usually Mama June sat rocking beside him in a companionable silence. He felt her absence deeply. "At least you're here, aren't you, boy?" he said, reaching down to pat the black Labrador retriever curled at his feet. Blackjack, who had sneaked back onto the porch the moment Mama June left, raised his dark, melting eyes and gazed at Preston with devotion while his tail thumped with affection. "Good ol' dog."